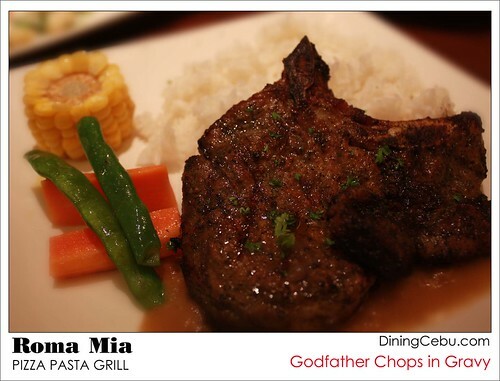 The adage that says “Once tasted, always wanted!” holds very true for Roma Mia’s Godfather Chops. Roma Mia’s Godfather Chops is my favorite porkchop in Cebu or in the whole wide world! Hehe. A bit exaggerated, but it’s very true. The serving size is adequate; the meat is soft, juicy, and medium done. The one I tried on this post was in gravy sauce. I’ve also tried the Godfather Chops in pesto, and it’s equally good (if you like pesto that is). Roma Mia’s Godfather Chops is just one up compared to Bigby’s Rodeo Chops! 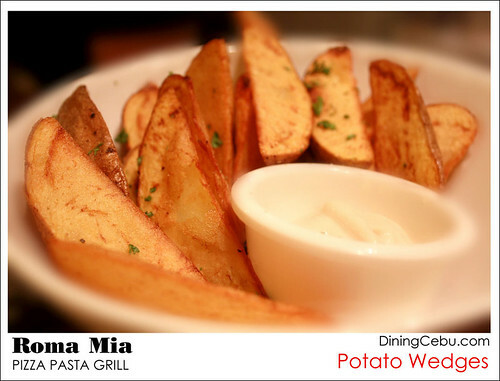 Roma Mia’s Potato Wedges were sliced huge! It reminded me of KFC’s french fries but only bigger and better (no offense meant KFC!). I’ve always liked these big fries unlike those served in most fastfood joints because I get to really taste the soft potatoes inside and not just the crunchy-fried exterior. 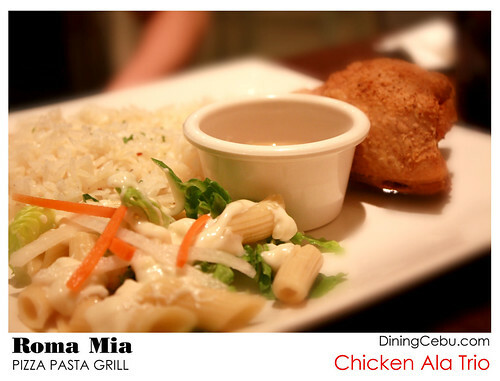 Roma Mia’s Chicken Ala Trio is a good and affordable combination. The chicken was indeed crispy and juicy, and it reminds me of Sunburst’s chicken. I dunno if that’s a good or a bad thing. But for me, I liked it! 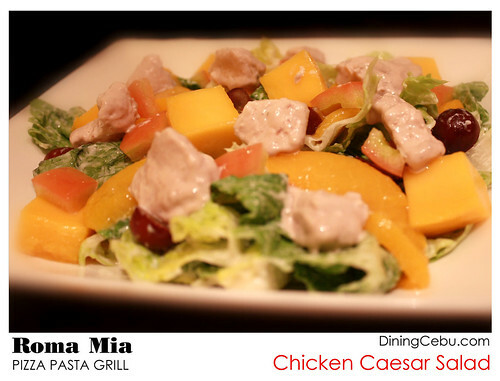 Nothing much to be said about Roma Mia’s Chicken Caesar Salad. It’s fairly very standard. I’m not much of a salad person unless there’s something really special about it just like what I had in Ambassador’s Cafe. 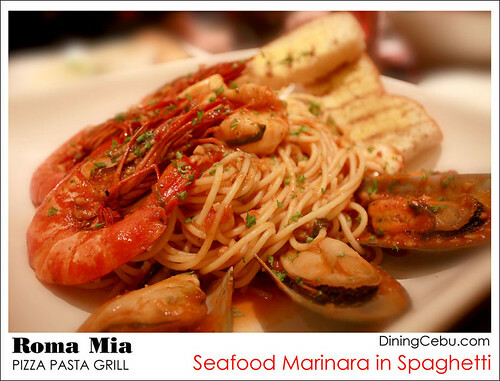 Wasn’t able to try this Seafood Marinara because it was one of those few moments in my life that I was ashamed to ask my friend to try his food! But looking at the photo, it’s quite a treat. 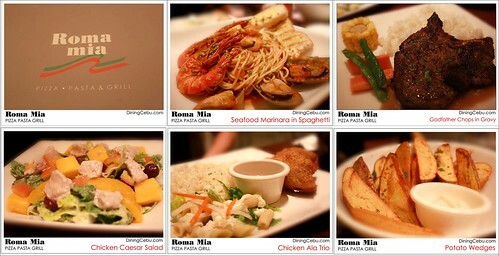 So have your porkchop craving fix over at Roma Mia and also try their other grilled dishes. For me, I should go back to have another Godfather Chops rediscover those Calzone that I used to love! i hate the accomodations of roma mia. but the services, its a turn off. yeah xtin47 the service can be a bit off. but bahala nalang kay i can’t help but droll over the godfather chops! hehe. Hi Cara, thanks for dropping by our blog. I’ll try that Godfather chops too one of these days. Since moving here to cebu almost 3 years back, I haven’t gone to Roma Mia just yet. But my hubby is dying to try out their Godfather Chops and is insisting on dining there this weekend! They put out this some sort of menu board at their doorway and those chops just stare back at us everytime we walk by their branch in Ayala Terraces. We’re into trying out different restos so your posts here are very helpful!